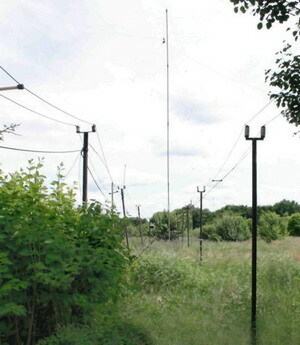 Cabinet of Ukraine Act # 1709 of December 19, 2001 ruled that the Facility for Remotely Sensing the Near-Earth Space Environment at the Kharkiv V. N. Karazin National University Radiophysical Observatory is included in the State Register of Scientific Research Instruments that constitute a National Asset. 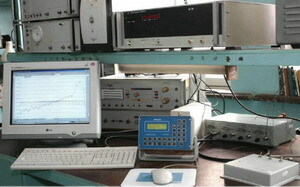 The instrumentation allows the researchers to investigate the various interacting processes operating in the ionosphere within an altitude range of ~60 – 19,000 km and the characteristics of radio-wave propagation within a frequency band of up to approximately 2 GHz, simultaneously with magnetometer measurements. The Radiophysical Observatory was completed in 1980. Its completion resulted from efforts carried out by head of the Department of Space Radio Physics Prof. Misyura V. A. and numerous researchers (Dr. Podnos V. A., Assciate Professor Kapanin I. I., Dr. Kostrov L. S., Dr. Garmash K. P., Dorohov V. L. and many other professionals). Since 1980, the results of experiments and their interpretations, and results of theoretical or modeling studies have been published in more than 450 original research papers and have been represented at 78 scientific meetings (including 34 international meetings). 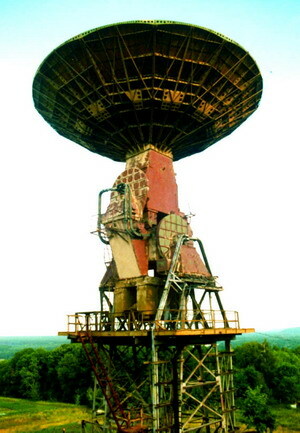 In 1995, the facility was involved in an international collaborative multi-site field campaign (Kharkiv V. N. Karazin National University, The Institute of Radio Astronomy (IRA) of the National Academy of Sciences of Ukraine, Radiophysical Research Institute (N. Novgorod, Russia), and the U.S.A.). The results of this study were published in leading international journals. In 1997– 1999 and 2001 – 2003, the facility was used in experiments supported by the U.S.A. through the Science and Technology Center in Ukraine projects 471 (Prof. Tyrnov O. F.), 1772 (Prof. Chernogor L. F.), and 1773 (Prof. Tyrnov O. F.). The facility is also used by graduate and undergraduate students in the Department of Space Radio Physics for carrying out work on their BS and MS research projects in radio physics. Large-scale perturbations in the near-Earth environment from localized sources of energy, which include HF high-power radio waves, launch of rockets, earthquakes, etc. Fully-steerable 15-meter UHF antenna for probing the ionosphere. 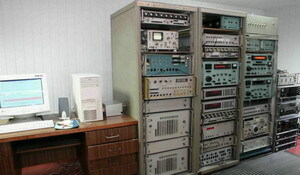 The Department of Space Radio Physics places great emphasis on research, and supports several major groups, which have a worldwide reputation. It is unique in Ukraine in its studies of processes linking the surface of the Sun to interplanetary space, the Earth's magnetosphere and ionosphere. Back in the 1960s, the space physics group promoted and implemented clustered-instrument investigations of the ionosphere. Department faculty, students and staff conduct research which concerns both measurements and theoretical interpretation, and is based on a range of experimental facilities available within easy reach of the Department at the Radiophysical Observatory. The Radiophysical Observatory comprises an MF radar, a spaced antenna drift radar, a HF Doppler radar (at vertical and oblique incidence), satellite radio beacon receivers, a fluxgate magnetometer, a UHF receiver system, and an ionosonde. The instrumentation allows the processes acting in the ionosphere within an altitude range of ~60 to about 19,0000 km (navigation satellite orbit) and characteristics of radio-wave propagation on many frequencies within a frequency band of 30 kHz–2 GHz to be investigated. 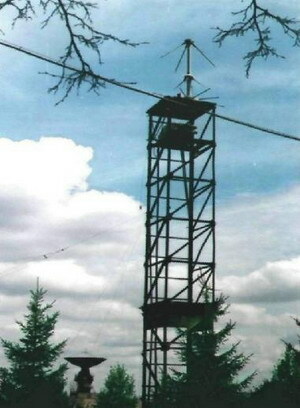 The MF radar is used for investigating the lower ionosphere and mesosphere between 60- and 115-km altitude by means of the differential absorption experiment and the spaced antenna drift technique. The radar operates in the 1.5 – 4.5 MHz frequency band, and consists of a 16-element linearly polarized transmitter antenna array of 300 x 300 m2 physical aperture, a circularly polarized receiving array of 2 crossed double rhombus antennas, and a polarization switch of 22 dB. The transmitter operates on a transmitter power level of 100 kW (peak power) and provides average power of 100 kW, pulse length of 20 micros up to continuous mode, and pulse repetition rate of 1 – 100 per second. The receiver has a dynamic range of 86 dB and an intermediate frequency bandwidth of 60 kHz. Both the antenna and the data acquisition system are reconfigurable from polarimeter to wind data acquisition. The facility permits the researchers to investigate a myriad of processes operating in the near-Earth space environment over time scales related to both natural and anthropogenic influences. A prominent accomplishment of the research that has been conducted with the MF radar is the development of a technique for sensing large (V/m) electric fields within the lower mesosphere remotely. This is the most exciting development, which gives very important original contribution to the global atmospheric electrical circuit. The results obtained with this MF radar fit neatly with other studies carried out as part of internationally coordinated research projects, mainly organized in the USA, under the banner of the ICSU body called SCOSTEP. The MF radar also allows the winds to be measured in the same part of the mesosphere simultaneously, thereby providing a means for studying the mechanisms for the generation of large mesospheric electric fields. The HF Doppler radar is used for investigating ionospheric plasma dynamics during disturbances, both natural and anthropogenic. The principal radar part is a master oscillator of 10–11 stability, and is capable of operating at a few frequencies in the 1.5 - 30 MHz frequency band at 0.01 Hz intervals. The techniques have been developed for acquiring measurements of undulating disturbances in F region parameters at vertical and oblique incidence in order to maximize altitude, spatial, and temporal coverage, and to detect variations over different time scales. 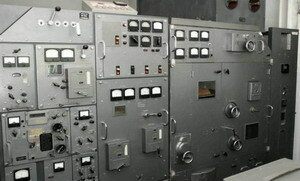 The transmitter operates on a power level of 1 kW (peak power) and provides a 500-s pulse length at a pulse repetition rate of 100 – 200 per second. The receiver has a dynamic range of 80 dB, intermediate frequency bandwidths of 10 kHz and 20 kHz, a system bandwidth of 10 Hz, an instrument error of 0.01 Hz at a maximum Doppler frequency shift of 5 Hz. The Department of Space Radio Physics has acquired satellite radio beacon receivers for signals from satellites of "Cicada," GLONASS, and GPS systems. Satellite radio beacon observations may provide a powerful technology for studies of space weather effects upon total electron content and electron density irregularities with various spatial scale sizes. The analysis of dual-frequency Doppler shift measurements at one site permits the temporal and spatial features of total electron content to be determined and specified over a sufficiently large territory. The collected satellite database is used to determine total electron content and the parameters of irregularity structure including traveling ionospheric disturbances in the mid-latitude F region during geomagnetically quiet and disturbed conditions. The magnetometer is installed at the Radiophysical Observatory. The data are autonomously recorded on a hard disk during about two months, and then the data have to be collected by a visiting researcher. The magnetometer and data recording system acquire measurements in the south-north (H component) and west-east (D) directions at half-second intervals in the 0.001 -1 Hz frequency band within which the magnetometer delivers differential performance. The internal noise level shows the following frequency dependence: 0.5 pT at f = 1 Hz, 5 pT at f =0.1 Hz, and 50 pT at f = 0.01Hz. Department is committed to maintaining strong relationships with educational and research institutions around the world and business and industry in Ukraine. Chernogor L. F. Oscillations of the Geomagnetic Field Caused by the Flight of Vitim Bolide on September 24, 2002 // Geomagnetism and Aeronomy. – 2011. – V. 51, № 1. – P. 116 – 130. Chernogor L. F., Frolov V. L., Komrakov G. P., Pushin V. F. Variations in the ionospheric wave perturbation spectrum during periodic heating of the plasma by high-power high-frequency radio waves // Radiophysics and Quantum Electronics. – 2011. – V. 54, No 2. – Pp. 75 – 88. Chernogor L. F., Grigorenko Ye. I., Lyashenko M. V. Effects in geospace during partial solar eclipses over Kharkiv // International Journal of Remote Sensing. – 2011. – V. 32, No 11. – Pp. 3219 – 3229. Chernogor L. F. The Earth-atmosphere-geospace system: main properties and processes // International Journal of Remote Sensing. – 2011. – V. 32, No 11. – Pp. 3199 – 3218. Chernogor L. F. Geomagnetic Field Fluctuations near Kharkov, which Accompanied Rocket Launches from the Baikonur Site // Geomagnetism and Aeronomy, 2009, v. 49, № 3, pp. 384 – 396. Burmaka V. P., Chernogor L. F. Complex Diagnostics of Disturbances in the Ionospheric Plazma Parameters Far from the Trajectories of Launched Rockets, Geomagnetism and Aeronomy, Vol. 49, No. 5, pp. 637 – 652, 2009. 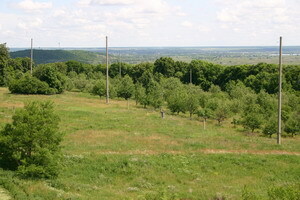 Gokov A.M., Gritchin A.I., Tyrnov O.F. Experimental Study of the Response of the Midlatitude Ionospheric D Region to the Solar Eclipce of March 29, 2006. // Geomagnetism and Aeronomy. 2008, Vol. 48, No. 2, pp. 232–239. Zalyubovsky I., Chernogor L., Rozumenko V. The Earth – Atmosphere – Geospace System: Main Properties, Processes and Phenomena // Space Research in Ukraine. 2006 – 2008. The Report Prepared by the Space Research Institute of NASU-NSAU. Kyiv. 2008. Pp. 19 – 29. Chernogor L. F., Rozumenko V. Т. Earth – Atmosphere – Geospace as an Open Nonlinear Dynamical System // Radio Physics and Radio Astronomy, 2008, vol. 13, № 2, pp. 120 – 137. Chernogor L. F. Effects of Solar Eclipses in the Surface Atmosphere. // Izvestiya, Atmospheric and Oceanic Physics, 2008, vol. 44, No 4, pp. 432 – 447. Chernogor L. F., Advanced Methods of Spectral Analysis of Quasiperiodic Wave_Like Processes in the Ionosphere: Specific Features and Experimental Results. // Geomagnetism and Aeronomy, 2008, v. 48, No 5, pp. 652 – 673. Martynenko S. I., and S. F. Clifford, On the Electrical Coupling Between the Troposphere and the Mesosphere, // International Journal of Geomagnetism and Aeronomy, Vol. 6, G I, 2007, pp. 1 - 6. Manson, A.H., Meek, C.E., Martynenko, S.I., Rozumenko, V.T., Tyrnov, O.F. (2006) VLF Phase Perturbations Produced by the Variability in Large (V/m) Mesospheric Electric Fields in the 60 – 70 km Altitude Range. In Characterising the Ionosphere (pp. 8-1 – 8-24). Meeting Proceedings RTO-MP-IST-056, Paper 8. Neuilly-sur-Seine, France: RTO. Available from: http://www.rto.nato.int/abstracts.asp. S. I. Martynenko, V. T. Rozumenko, O. F. Tyrnov, A. H. Manson, and C. E. Meek, Statistical parameters of nonisothermal lower ionospheric plasma in the electrically active mesosphere, Advances in Space Research, vol. 35, 1467 – 1471, 2005 (doi: 10.1016/j.asr.2005.03.041). Akimov, L. A., V. K. Bogovskii, E. I. Grigorenko, V. I. Taran, and L. F. Chernogor, Atmospheric–Ionospheric Effects of the Solar Eclipse of May 31, 2003, in Kharkov, Geomagnetism and Aeronomy, 2005, vol. 45, no. 4, pp. 494 – 518. Meek, C. E., A. H. Manson, S. I. Martynenko, V. T. Rozumenko, and O. F. Tyrnov, Remote sensing of mesospheric electric fields using MF radars, J. Atmos. Solar-Terr. Phys., vol. 66, 881 – 890, 2004 (doi: 10.1016/j.jastp.2004.02.002, 2004). Fuks, I. M., and S. I. Martynenko, Comment on “On the long-range detection of radioactivity using electromagnetic radiation”, Nuclear Instruments & Methods in Physics Research, Section A, Vol. 523, issue 1 – 2, pp. 246 – 248, May 2004. Bogdanov Yu.A., Zakharov I.G., Tyrnov O.F., Hayakawa M., Electromagnetic Effects Associated with Regional Seismic Activity in Crimea and Japan over the July – August 2002 Interval, J. Atmospheric Electricity, 2003, vol. 23, no. 2, pp. 57 – 67. Gokov, A. M., and O. F. Tyrnov, The midlatitude ionosphere D-region response to some events on the sun, Adv. Space Res., vol. 31, no. 4, pp. 1001 – 1006, 2003. Gokov, A. M., and O. F. Tyrnov, Experimental investigations of the middle latitude ionospheric D-region reaction to geomagnetic sudden storm commencements, Journal of Atmospheric Electricity, vol. 23, no. 1, pp. 21 – 29, 2003. Grigorenko, E. I., S. V. Lazorenko, V. I. Taran, L. F. Chernogor, Wave Disturbances in the Ionosphere Accompanying the Solar Flare and the Strongest Magnetic Storm of September 25, 1998, Geomagnetism and Aeronomy, 2003,vol. 43, no. 6, pp. 718 – 735. Martynenko, S. I., On the Role of Ion Number Density Disturbances in VLF Sprite Relaxation, Adv. Space Res., vol. 30, no. 11, 2601 – 2605, 2002. Gokov, A. M., and O. F. Tyrnov, Some Features of Lower Ionosphere Dynamics Caused by the Morning Solar Terminator, Journal of Atmospheric Electricity, vol. 22, no. 1, pp. 13 – 21, 2002. Martynenko, S. I., V. T. Rozumenko, and O. F. Tyrnov, New Possibilities for Mesospheric Electricity Diagnostics, Adv. Space Res., 27, 1127 – 1132, 2001. Gokov, A. M., and O. F. Tyrnov, To a Question of Modeling HF and VHF Radio Waves Propagating IN the Middle Latitude Lower Ionosphere, Journal of Atmospheric Electricity, vol. 21, no 2, pp. 79 – 86, 2001. Gokov, A. M., and O. F. Tyrnov, Experimental Investigations of Electron Density Variations in the Middle Latitude Ionospheric D-Region During Remote Strong Earthquakes, Telecommunications and Radio Engineering, vol. 55, no. 5, pp. 8 –15, 2001. Ponomarenko, P. V., Yu. M. Yampolski, A. V. Zalizovsky, D. L. Hysell, O. F. Tyrnov, Interaction between artificial ionospheric irregularities and natural MHD waves, J. Geophys. Res, 105, 171 – 181, 2000. Gokov, A. M., and O. F. Tyrnov, Partial reflection technique investigation of the lower ionosphere response to strong remote earthquakes, J. Atmos. Electricity, 20, 63 – 73, 2000. Martynenko, S. I., V. T. Rozumenko, A. M. Tsymbal, O. F. Tyrnov, and A. M. Gokov, Mesospheric electric field measurements with a partial reflection radar, J. Atmos. Electricity, 19, 81–86, 1999. 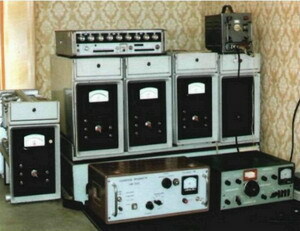 Martynenko, S. I., Atmospheric electric field and disturbances of the lower ionosphere parameters, J. Atmos. Electricity, 19, 1 – 9, 1999. Yampolski, Yu. M., V. S. Beley, S. B. Kascheev, A. V. Koloskov, V. G. Somov, D. L. Hysell, B. Isham, and M. C. Kelley, Bistatic HF radar diagnostics induced field-aligned irregularities, J. Geophys. Res., 102, 7461 – 7467, 1997. Hysell, D. L., M. C. Kelley, Yu. M. Yampolski, V. S. Beley, A. V. Koloskov, and O. F. Tyrnov, HF radar observations of decaying artificial field aligned irregularities, J. Geophys. Res., 101, 26,981 – 26,993, 1996. Zakharov I.G., Tyrnov O.F. Short-term critical frequency variations and their predictions in the midlatitude ionospheric F2 region. Phys. Chem. Earth ( C ) . 1999. Vol. 24. No. 4. PP. 371 – 374. Pushin, V. F., Fedorenko, V.N., Fedorenko, Yu. P., Tyrnov, O.F., Shagimuratov, I.I. Space correction of global models of electron number density in the ionosphere by receiving at one site signals from low-orbit satellites. Phys. Chem. Earth. ( C ). 1999. Vol. 24. No. 4. PP. 375 – 378. Martynenko, S. I., I. M. Fuks, and R. S. Shubova, Ionospheric electric-field influence on the parameters of VLF signals connected with nuclear accidents and earthquakes, J. Atm. Electricity, 16, 259 – 269, 1996. Fuks, I. M., R. S. Shubova, and S. I. Martynenko, Lower ionosphere response to conductivity variations of the near-earth atmosphere, J. Atmos. Solar-Terr. Phys., 59, 961 – 965, 1997. Garmash, K. P., L. S. Kostrov, V. T. Rozumenko, O. F. Tyrnov, A. M. Tsymbal, L. F. Chernogor, Global Ionospheric Disturbances Caused by a Rocket Launch against a Background of a Magnetic Storm, Geomagnetism and Aeronomy, 1999, vol. 39, no. 1, pp. 69 – 75. Zakharov, I. G., and O. F. Tyrnov, Principles and Method of Forecasting the Critical Frequency Variations of the Mid-Latitude Ionospheric F2 Region From Solar and Geomagnetic Activity Indices, Telecommunications and Radio Engineering, 53, No. 1, 13 – 16, 1999. Pushin, V. F., and L. S. Kostrov, 3-D Ray-Tracing Synthesis of Multiparameter Ionograms as Obtained by Digital Sounders in a Disturbed Ionosphere, Telecommunications and Radio Engineering, 53, No. 2, 58 – 64, 1999. Buts, V. A., and V. A. Chatskaya, An Anomalous Effect of Fluctuations on Charged Particle Dynamics under Autoresonance Conditions, Telecommunications and Radio Engineering, 53, No. 2, 68 – 71, 1999. Garmash, K. P., A. M. Gokov, L. S. Kostrov, V. T. Rozumenko, O. F. Tyrnov, Y. P. Fedorenko, A. M. Tsymbal, and L. F. Chernogor, Radiophysical Investigations and Modeling of Ionospheric Processes Generated by Sources of Various Nature. 1. Processes in a Naturally Disturbed Ionosphere. Technical Facilities, Telecommunications and Radio Engineering, 53, No. 4 – 5, 6 – 20, 1999. Zakharov, I. G., and O. F. Tyrnov, A Model of the Total Columnar Electron Content in the Ionosphere for the Latitudes 25 to 70o N, Telecommunications and Radio Engineering, 53, No. 4 – 5,38 – 44, 1999. Garmash, K. P., A. M. Gokov, L. S. Kostrov, V. T. Rozumenko, O. F. Tyrnov, Y. P. Fedorenko, A. M. Tsymbal, and L. F. Chernogor, Radiophysical Investigations and Modeling of Ionospheric Processes Generated by Sources of Various Nature. 2. Processes in a Modified Ionosphere. Signal Parameter Variations. Disturbance Simulation, Telecommunications and Radio Engineering, 53, No. 6, 1 – 22, 1999. Martynenko, S. I., A Relaxation Model of Plasma Formations During High-Altitude Discharges, Telecommunications and Radio Engineering, 53, No. 7 – 8, 13 – 18, 1999. Zakharov, I. G., Correlation Between Solar Wind Energy and Non-Tidal Variations of Earth Rotation Velocity, Telecommunications and Radio Engineering, 53, No. 9 – 10, 49 – 54, 1999. Gokov, A. M., and O. F. Tyrnov, Experimental investigations of strong thunderstorms having effect on the middle latitude ionospheric D-region parameters, Telecommunications and Radio Engineering, 53, No. 7 – 8, 6 – 12, 1999. Gokov. A. M., and O. F. Tyrnov, Application of the Partial Reflections Techniques To Studying the Response of the Lower Ionosphere to Strong Distant Earthquakes, Telecommunications and Radio Engineering, 51, 92 – 97, 1997. Lazorenko, O. V., and L. F. Chernogor, Dispersive Distortions of High-Frequency, Super Wide-Band Radio Signals in the Interplanetary Plasma, Telecommunications and Radio Engineering, 51, 19 – 21, 1997. Lazorenko, O. V., and L. F. Chernogor, Special Features of Disturbed Targets Radar Equation When Employing Super Wide-Band Signals, Telecommunications and Radio Engineering, 51, 88 – 91, 1997. Kostrov, L. S., V. T. Rozumenko, O. F. Tyrnov, and A. M. Tsymbal, Perturbations in the ionosphere following U.S. powerful space vehicle launching, Radio Physics and Radio Astronomy, 3, 181 – 190, 1998. Zakharov, I. G., M. K. Mishanova, and O. F. Tyrnov, Effects of solar and geomagnetic activity on cyclic variations in mental diseases, School of Fundamental Medicine J., 4, 32 – 35, 1998. Zakharov, I. G., M. K. Mishanova, and O. F. Tyrnov, Effects of solar and geomagnetic activity on pupils' behavior and progress in studies, School of Fundamental Medicine J., 4, 75 – 77, 1998. Chernogor L., Rozumenko V. Physical effects in the geospace environment under quiet and disturbed conditions // Space Research in Ukraine. – The Report Prepared by the Space Research Institute of NAS of Ukraine and NSA of Ukraine, Kyiv. 2010. – Pp. 22 – 34. Zalyubovsky I., Chernogor L., Rozumenko V. The Earth – Atmosphere – Geospace System: Main Properties, Processes and Phenomena // Space Research in Ukraine. 2006 – 2008. The Report Prepared by the Space Research Institute of NASU-NSAU. Kyiv. 2008. Pp. 19 – 29 (in Russian). Garmash, K. P., V. T. Rozumenko, O. F. Tyrnov, A. M. Tsymbal, and L. F. Chernogor, Radio-wave remote sensing of processes resulting from high-energy disturbances in the near-earth plasma. 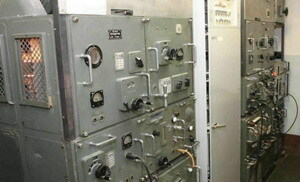 Part 1, Foreign Radio electronics. Advances in Modern Radio electronics, 1999. No. 7. pp. 3–15 (in Russian). Garmash, K. P., V. T. Rozumenko, O. F. Tyrnov, A. M. Tsymbal, and L. F. Chernogor, Radio-wave remote sensing of processes resulting from high-energy disturbances in the near-earth plasma. Part 2, Foreign Radio electronics. Advances in Modern Radio electronics, 1999. No. 8. pp. 3–19 (in Russian). Garmash, K. P., L. S. Kostrov, V. T. Rozumenko, O. F. Tyrnov, A. M. Tsymbal, and L. F. Chernogor, Global-scale ionospheric disturbances launched by a rocket launch against the background of a magnetic storm, Geomagnetism and Aeronomy, 39, 72–78, 1999 (in Russian). Martynenko, S. I., Interrelations between time and space scales of disturbances launched by external electric field in the lower ionosphere, Geomagnetism and Aeronomy, 39, No. 2, 1999 (in Russian). Fedorenko, Yu. P., Long distance high-frequency ionospheric propagation by means of an artificial ionospheric periodic irregularities arising in intersecting beams of powerful coherent continuous radio waves, Geomagnetism and Aeronomy, 38, 73–81, 1998, (in Russian). Gokov, A. M., and O. F. Tyrnov, Experimental investigations of the effects of strong thunderstorms on the parameters of the midlatitude ionospheric D region. Geomagnetism and Aeronomy, 38, 184–188, 1998, (in Russian). Garmash, K. P., and L. F. Chernogor, Electromagnetic and geophysical processes stimulated by high-power radio waves in the near-earth plasma, Electromagnetic phenomena, 1, 90–110, 1998 (in Russian). Pushin, W. F., and L. S. Kostrov, Three-dimentional ray-tracing synthesis of multi-parameter ionogram data from digisondes during disturbed conditions, Bulletin of Kharkiv State University. Radio Physics and Electronics, 1999, No. 427, pp. 23–28 (in Russian). Garmash, K. P., A. M. Gokov, L. S. Kostrov, V. A. Podnos, V. T. Rozumenko, O. F. Tyrnov, Yu. P. Fedorenko, A. M. Tsymbal, and L. F. Chernogor, Radio wave experimental and modeling studies of the processes originating in the ionosphere from disturbances of various nature. 2. Processes in the ionosphere under artificially disturbed conditions. Variations in radio signal characteristics. Modeling the disturbances, Bulletin of Kharkiv State University. Radio Physics and Electronics, 1999, No. 427, pp. 3–22 (in Russian). Garmash, K. P., A. M. Gokov, L. S. Kostrov, V. T. Rozumenko, O. F. Tyrnov, Yu. P. Fedorenko, A. M. Tsymbal, and L. F. Chernogor, Radio Wave Investigations and Modeling the Processes in the Ionosphere Disturbed by Sources of Various Nature. 1. Instrumentation and Processes in the Naturally Disturbed Ionosphere, Bulletin of Kharkiv State University Radio Physics and Electronics, 1998, No. 405, pp. 157–176, (in Russian). Martynenko, S. I., Effects of the transport processes on the evolution of disturbances in the ionospheric D region, Bulletin of Kharkiv State University. Radio Physics and Electronics, 1999, No. 427, pp. 34–37 (in Russian). Zakharov, I. G., On the relationship between solar wind energy and non-tidal variations in earth's rotation rate, Bulletin of Kharkiv State University. Radio Physics and Electronics, 1999, No. 427, pp. 38–41 (in Russian). Zakharov, I. G., and O. F. Tyrnov, Principles and technique for forecasting the variation in the critical frequency of the mid-latitude ionospheric F region using solar and geomagnetic indices. 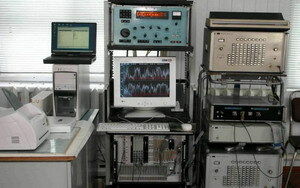 Bulletin of Kharkiv State University Radio Physics and Electronics. 1998, No. 405. PP. 108–111, (in Russian). Lyashenko M., Domnin I., Chernogor L., Development of Central Europe Regional Ionospheric Model (CERIM IION) based on Kharkov incoherent scatter radar // COST ES0803 Workshop on Assessment and Validation of Space Weather Models. Universidad de Alcala, Spain, 16 – 17 March 2011. – Pp. 23 – 24. Garmash K. P., Gritchin A. I., Martynenko S. I., Podnos V. A., Rozumenko V. T., Tyrnov O. F., Fedorenko V. N., Fedorenko Yu. P., Tsymbal A. M., Chernogor L. F., Kharkiv V. N. Karazin National University Radiophysical Observatory: Space Research, 2009 19th Int. Crimean Conference “Microwave & Telecommunication Technology” (CriMiCo’2009). 14-18 September, Sevastopol, Crimea, Ukraine, Vol. 2, pp. 943 – 944 (ISBN: 978-966-335-244-2. IEEE Catalog Number: CFP09788). S. I. Martynenko, V. T. Rozumenko, O. F. Tyrnov, The MF Radar Technique: Potential for Studies in the Mesospheric Electro-Dynamic Arena, Fourth UN/ESA/NASA/JAXA/BAS Workshop on the International Heliophysical Year 2007 and Basic Space Science "First Results from the International Heliophysical Year 2007". Solar-Terrestrial Influences Laboratory at the Bulgarian Academy of Sciences. 02 – 06 June 2008, Sozopol, Bulgaria. Book of Abstracts. P. 14. Chernogor, L. F., S. V. Panasenko, V. T. Rozumenko, O. F. Tyrnov, The observational features of the November 7 – 10, 2004 geospace superstorm in the lower ionosphere, Fourth UN/ESA/NASA/JAXA/BAS Workshop on the International Heliophysical Year 2007 and Basic Space Science "First Results from the International Heliophysical Year 2007". Solar-Terrestrial Influences Laboratory at the Bulgarian Academy of Sciences. 02 – 06 June 2008, Sozopol, Bulgaria. Book of Abstracts. Pp. 50 – 51. Chernogor, L. F., Ye. I. Grigorenko, V. N. Lysenko, V. T. Rozumenko, V. I. Taran, Ionospheric Storms Associated with Geospace Storms as Observed with the Kharkiv Incoherent Scatter Radar, Fourth UN/ESA/NASA/JAXA/BAS Workshop on the International Heliophysical Year 2007 and Basic Space Science "First Results from the International Heliophysical Year 2007". Solar-Terrestrial Influences Laboratory at the Bulgarian Academy of Sciences. 02 – 06 June 2008, Sozopol, Bulgaria. Book of Abstracts. P. 52. A. M. Gokov, V. A. Podnos, A. M. Tsymbal, O. F. Tyrnov, The Midlatitude D-Region Response to Geomagnetic Storms, Fourth UN/ESA/NASA/JAXA/BAS Workshop on the International Heliophysical Year 2007 and Basic Space Science "First Results from the International Heliophysical Year 2007". Solar-Terrestrial Influences Laboratory at the Bulgarian Academy of Sciences. 02 – 06 June 2008, Sozopol, Bulgaria. Book of Abstracts. P. 54. Manson, A. H., C. E. Meek, S. I. Martynenko, V. T. Rozumenko, and O. F. Tyrnov, VLF Phase Perturbations Produced by the Variability in Large (V/m) Mesospheric Electric Fields in the 60 – 70 km Altitude Range, NATO RTO/URSI Symposium on “Characterising the Ionosphere” (Fairbanks, Alaska, United States, 12 – 16 June 2006), 23 pp. Chernogor, L., S. Clifford, S. Panasenko, V. Rozumenko, 2006. MF radar studies of wave disturbances in the mesosphere. 36th COSPAR Scientific Assembly, C2.2-0083-06. Martynenko, S. I., Strong Mesospheric Electric Fields and Troposphere-Mesosphere Coupling, XXVII General Assembly of the International Union of Radio Science, Poster presentation 134, Maastricht Exhibition and Congress Center (MECC), Maastricht, The Netherlands, 17 – 24 August 2002. P. 65. Tyrnov, O. F., and A. G. Tyzhnenko, The Ionospheric Vertical Electron Density Profile Reconstruction Using Satellite Signal Doppler Shift Measurements, XXVII General Assembly of the International Union of Radio Science, Poster presentation 118, Maastricht Exhibition and Congress Center (MECC), Maastricht, The Netherlands, 17 – 24 August 2002. Chernogor L. F., Ye. I. Grigorenko, V. I. Taran, and O. F. Tyrnov, Complex Radiophysical Studies of Dynamic Processes in the Ionosphere during the August 11, 1999 Solar Eclipse, XXVII General Assembly of the International Union of Radio Science, Poster presentation 2278, Maastricht Exhibition and Congress Center (MECC), Maastricht, The Netherlands, 17 – 24 August 2002. Chernogor L. F., Ye. I. Grigorenko, V. I. Taran, and O. F. Tyrnov, Ionospheric Wave-Like Disturbances (WLD) Following the September 23, 1998 Solar Flare from Kharkiv Incoherent Scatter Radar Observations, XXVII General Assembly of the International Union of Radio Science, Poster presentation 2279, Maastricht Exhibition and Congress Center (MECC), Maastricht, The Netherlands, 17 – 24 August 2002. P. 65. Chernogor L. F., Ye. I. Grigorenko, V. I. Taran, and O. F. Tyrnov, Dynamic processes in the near-earth plasma during September 25, 1998 magnetic storm from Kharkiv incoherent scatter radar data, XXVII General Assembly of the International Union of Radio Science, Poster presentation 2280, Maastricht Exhibition and Congress Center (MECC), Maastricht, The Netherlands, 17 – 24 August 2002. Chernogor, L. F., L. S. Kostrov, V. T. Rozumenko, O. F. Tyrnov, and A. M. Tsymbal, Variations in HF Doppler radar spectra measured at vertical incidence, XXVII General Assembly of the International Union of Radio Science, Poster presentation 143, Maastricht Exhibition and Congress Center (MECC), Maastricht, The Netherlands, 17 – 24 August 2002. P. 65. Chernogor, L. F., L. S. Kostrov, V. T. Rozumenko, and O. F. Tyrnov, Doppler radar measurements of bottomside ionosphere perturbations associated with space vehicle launch and maneuvering system burns, XXVII General Assembly of the International Union of Radio Science, Poster presentation 142, Maastricht Exhibition and Congress Center (MECC), Maastricht, The Netherlands, 17 – 24 August 2002. 10. Gokov, A. M., S. I. Martynenko, V. T. Rozumenko, and O. F. Tyrnov, Large-Scale Disturbances Originating From Remote Earthquakes and Strong Mesospheric Electric Fields, XXVII General Assembly of the International Union of Radio Science, Poster presentation 135, Maastricht Exhibition and Congress Center (MECC), Maastricht, The Netherlands, 17 – 24 August 2002. P. 65. 11. Gokov, A. M., and O. F. Tyrnov, Some peculiarities of the lower ionosphere dynamics, caused by the morning solar terminator, XXVII General Assembly of the International Union of Radio Science, Poster presentation 500, Maastricht Exhibition and Congress Center (MECC), Maastricht, The Netherlands, 17 – 24 August 2002. Tyrnov, O. F., and I. G. Zakharov, On the Causes of Day-To-Day Variations in the Mid-Latitude Ionospheric F2 Region Electron Density, XXVII General Assembly of the International Union of Radio Science, Poster presentation 198, Maastricht Exhibition and Congress Center (MECC), Maastricht, The Netherlands, 17 – 24 August 2002. 13. Taran, V. I., G. A. Kiyashko, and V. T. Rozumenko, Incoherent Scatter Radar Study of the April 28 – 29, 2001 Storm at Kharkiv, XXVII General Assembly of the International Union of Radio Science, Poster presentation 1093, Maastricht Exhibition and Congress Centre (MECC), Maastricht, The Netherlands, 17 – 24 August 2002. 14. Bogdanov, Yu. A., and I. G. Zakharov, Short-Term Earthquakes' Geopolariton Precursor, The 2nd International Conference on Earth Sciences and Electronics, Istanbul University, Turkey, 311 – 323 pp., 2002. 15. Zakharov, I. G., O. L. Mozgovaya, On Thermospheric/ Ionospheric Disturbances Under Quiet And Perturbed Conditions, IX Joint International Symposium, Atmospheric and Ocean Optics, Atmospheric Physics, 2 – 5 July 2002, Tomsk, Abstracts, Session D3, Tomsk, 2002, p. 149. Zakharov, I. G., and O. F. Tyrnov, Characteristic Features and the Nature of Weekly and Seasonal Rhythms of Morbidity, Cosmos and Biosphere. Physical Fields in Biology, Medicine and Ecology. International Crimean Seminar. October 1–6, 2001. Abstracts. Pp. 194–198, 2001. Zakharov, I. G., and O. F. Tyrnov, Effects of Solar Events on the Earth's Rotation and Other Geophysical Parameters, Committee on Space Research. 33rd COSPAR Scientific Assembly. Warsaw, Poland. 16–23 July, 2000. Scientific Commission C: Space Studies of the Upper Atmosphere of the Earth and Planets including Reference Atmospheres. P. 81. Chernogor, L. F., and V. T. Rozumenko, PERTURBATIONS IN THE NEAR-EARTH PLASMA FROM ROCKET LAUNCH AND ENGINE BURNS, Committee on Space Research. 33rd COSPAR Scientific Assembly. Warsaw, Poland. 16–23 July, 2000. Scientific Commission C: Space Studies of the Upper Atmosphere of the Earth and Planets including Reference Atmospheres. P. 82. Chernogor, L. F., and V. T. Rozumenko, WAVE PROCESSES AND GLOBAL-SCALE DISTURBANCES IN NEAR-EARTH SPACE, Committee on Space Research. 33rd COSPAR Scientific Assembly. Warsaw, Poland. 16–23 July, 2000. Scientific Commission C: Space Studies of the Upper Atmosphere of the Earth and Planets including Reference Atmospheres. P. 83. Tyrnov, O. F., and A. M. Gokov, THE MIDLATITUDINAL IONOSPHERIC D-REGION RESPONSE TO SOME EVENTS ON THE SUN, Committee on Space Research. 33rd COSPAR Scientific Assembly. Warsaw, Poland. 16–23 July, 2000. Scientific Commission C: Space Studies of the Upper Atmosphere of the Earth and Planets including Reference Atmospheres. P. 136. Martynenko, S. I., INFLUENCE OF STRONG MESOSPHERIC ELECTRIC FIELDS ON D REGION SPATIAL STRUCTURES, Committee on Space Research. 33rd COSPAR Scientific Assembly. Warsaw, Poland. 16–23 July, 2000. Scientific Commission C: Space Studies of the Upper Atmosphere of the Earth and Planets including Reference Atmospheres. P. 244. Martynenko, S. I., ON THE ROLE OF ION NUMBER DENSITY DISTURBANCES IN VLF SPRITE RELAXATION, Committee on Space Research. 33rd COSPAR Scientific Assembly. Warsaw, Poland. 16–23 July, 2000. Scientific Commission C: Space Studies of the Upper Atmosphere of the Earth and Planets including Reference Atmospheres. P. 322. Gokov, A. M., ATMOSPHERIC ELECTRICITY OF A MEGA-POLIS AND ITS EFFECTS ON THE LOWER IONOSPHERE, Committee on Space Research. 33rd COSPAR Scientific Assembly. Warsaw, Poland. 16–23 July, 2000. Scientific Commission C: Space Studies of the Upper Atmosphere of the Earth and Planets including Reference Atmospheres. P. 428. O. F. Tyrnov, S. I. Martynenko and V. T. Rozumenko, NEW POSSIBILITIES FOR MESOSPHERIC ELECTRICITY DIAGNOSTICS, Committee on Space Research. Committee on Space Research. 33rd COSPAR Scientific Assembly. Warsaw, Poland. 16–23 July, 2000. Scientific Commission C: Space Studies of the Upper Atmosphere of the Earth and Planets including Reference Atmospheres. P. 429. Zakharov, I. G., and O. F. Tyrnov, THE EFFECT OF SOLAR ACTIVITY ON ILL AND HEALTHY PEOPLE UNDER CONDITIONS OF NEUROUS AND EMOTIONAL STRESSES, Committee on Space Research. 33rd COSPAR Scientific Assembly. Warsaw, Poland. 16–23 July, 2000. Scientific Commission F: Life Sciences as Related to Space. P. 671. Buts, A. V., V. A. Chatskaya, and O. F. Tyrnov, Beam instability caused by stochastic plasma density fluctuations, VIIIth Ukrainian Conference and School on Plasma Physics and Controlled Fusion, Alushta (Crimea). September 11–16, 2000. Book of abstracts, NSC KIPT, Kharkov, 2000, P. 129. Gokov, A. M., S. I. Martynenko, V. T. Rozumenko, and O. F. Tyrnov, Large-scale disturbances originating from remote earthquakes in the plasma at mesospheric heights, VIIth International Conference on Mathematical Methods in Electromagnetic Theory. Conference Proceedings. Kharkov. Ukraine. September 12–15, 2000, vol. 2, pp. 655–657. Chernogor, L. F., L. S. Kostrov, and V. T. Rozumenko, HF Doppler probing the disturbances originating in the ionosphere from natural and anthropogenic sources, VIIth International Conference on Mathematical Methods in Electromagnetic Theory. Conference Proceedings. Kharkov. Ukraine. September 12–15, 2000, vol. 2, pp. 652–654. Martynenko, S. I., Strong mesospheric electric fields and troposphere-mesosphere coupling, VIIth International Conference on Mathematical Methods in Electromagnetic Theory. Conference Proceedings. Kharkov. Ukraine. September 12–15, 2000, vol. 2, pp. 627–629. Chernogor, L. F., and O. V. Lazorenko, Application of the wavelet analysis for detecting ultra-wideband signals in noise, VIIth International Conference on Mathematical Methods in Electromagnetic Theory. Conference Proceedings. Kharkov. Ukraine. September 12–15, 2000, vol. 1, pp. 233–235. Martynenko S. I. Atmospheric VLF sprites : A relaxation model // XXVI th General Assembly of the URSI ( Toronto. Canada. August 13–21, 1999 ). Abstracts. – Toronto: University of Toronto, 1999. – P. 761. Martynenko S.I., Dorohov V.L., Rozumenko V.T., Tyrnov O.F. Midlatitude ionospheric disturbances induced by modifications of high-latitude ionosphere by high-power radio waves // XXVI th General Assembly of the URSI ( Toronto. Canada. August 13–21, 1999 ) . Abstracts. – Toronto: University of Toronto, 1999. – P. 299. Tyrnov O. F., Martynenko S. I., Rozumenko V. T., Tsymbal A. M., Gokov A. M. Strong electric fields in the middle atmosphere : New data from ground-based measurements // XXVI th General Assembly of the URSI ( Toronto. Canada. August 13–21, 1999 ). Abstracts. – Toronto: University of Toronto, 1999. – P. 299. Tyrnov O. F., Gokov A. M. Investigation of mechanisms for 2–4 MHz radio wave scattering from plasma irregularities in the lower ionosphere // XXVI th General Assembly of the URSI ( Toronto. Canada. August 13–21, 1999 ). Abstracts. – Toronto: University of Toronto, 1999. – P. 457. Tyrnov O. F., Gokov A. M. Peculiarities of variations in ionospheric parameters of the lower D-region during natural disturbances // XXVIth General Assembly of the URSI ( Toronto. Canada. August 13–21, 1999 ). Abstracts. – Toronto: University of Toronto, 1999. – P. 466. Chernogor L. F., Garmash K. P., Rozumenko V. T., Tyrnov O. F. Energetic particle fluxes in the midlatitude lower ionosphere from partial reflection radar measurements // XXVI th General Assembly of the URSI ( Toronto. Canada. August 13–21, 1999 ). Abstracts. – Toronto: University of Toronto, 1999. – P. 437. Chernogor L. F., Garmash K. P., Rozumenko V. T. Variations of partially reflected radio signals after rocket launches // XXVIth General Assembly of the URSI ( Toronto. Canada. August 13–21, 1999 ). Abstracts. – Toronto: University of Toronto, 1999. – P. 467. Chernogor L. F. Generation of wave disturbances in the near-earth medium by earthquakes and their precursors // XXVI th General Assembly of the URSI ( Toronto. Canada. August 13–21, 1999 ). Abstracts. – Toronto: University of Toronto, 1999. – P. 750. Chernogor, L. F., Non-Resonance Magnetosphere Heating by High-Power VLF Radio Waves. 8th Scientific Assembly of IAGA with ICMA and STP Symposia. Uppsala, IAGA 1997. Abstract Book. P. 346. Gokov, A. M., S. I. Martynenko, and O. F. Tyrnov, Electric Field Intensity Measurements Using the Partial Reflection Technique. 8th Scientific Assembly of IAGA with ICMA and STP Symposia. Uppsala, IAGA 1997. Abstract Book. P. 227. Gokov, A. M., and O. F. Tyrnov, Electron Collision Frequency Variations in the Lower Ionospheric D-Region During Magnetic Storm. 8th Scientific Assembly of IAGA with ICMA and STP Symposia. Uppsala, IAGA 1997. Abstract Book. P. 228. Gokov, A. M., and O. F. Tyrnov, On Strong Thunderstorms Affecting the Ionospheric D-Region Parameters, Characteristics of Noise and Partially-Reflected Signals. 8th Scientific Assembly of IAGA with ICMA and STP Symposia. Uppsala, IAGA 1997. Abstract Book. P. 227. Gokov, A. M., and O. F. Tyrnov, Experimental Investigations of Frequency Variations of Electron/Neutral Collisions in the Ionospheric D-Region. 8th Scientific Assembly of IAGA with ICMA and STP Symposia. Uppsala, IAGA 1997. Abstract Book. P. 136. Martynenko, S. I., The Relation Between Scale Times and Scale Lengths in the Disturbed Ionospheric Plasma. 8th Scientific Assembly of IAGA with ICMA and STP Symposia. Uppsala, IAGA 1997. Abstract Book. P. 138. Tyrnov, O. F., S. I. Martynenko, Yu. B. Milovanov, V. T. Rozumenko, and A. M. Tsymbal, Atmospheric Electricity and Lower Ionosphere Disturbances. 8th Scientific Assembly of IAGA with ICMA and STP Symposia. Uppsala, IAGA 1997. Abstract Book. P. 227. Zakharov, I. G., and O. F. Tyrnov, Solar Wind Effects on 27-Day Variations of a Length of Day (LOD). 8th Scientific Assembly of IAGA with ICMA and STP Symposia. Uppsala, IAGA 1997. Abstract Book. P. 382. Zakharov, I. G., O. F. Tyrnov, V. L. Gaevsky, and V. V. Nikonov, Heliogeophysical Stipulation of a Trauma Level under Urban Conditions. 8th Scientific Assembly of IAGA with ICMA and STP Symposia. Uppsala, IAGA 1997. Abstract Book. P. 382. Zakharov, I. G., and O. F. Tyrnov, Day-to-Day Critical-Frequency Variations in the Midlatitude Ionospheric F2-Region Due to Solar and Geomagnetic Activities. 8th Scientific Assembly of IAGA with ICMA and STP Symposia. Uppsala, IAGA 1997. Abstract Book. P. 138. Chernogor, L. F., K. P. Garmash, L. S. Kostrov, S. G. Leus, S. N. Pokhil'ko, V. T. Rozumenko, A. M. Tsymbal, O. F. Tyrnov, HF Doppler probing of ionospheric perturbations which accompanied the Space Shuttle Atlantis launch with a geomagnetic storm as a background. Annales Geophysicae. 1998. Part III. Space & Planetary Sciences. Supplement III to Volume 16. P. C839. Chernogor, L. F., K. P. Garmash, V. T. Rozumenko, and O. F. Tyrnov, On the possibility of energetic particle precipitation from the magnetosphere into the middle latitude ionosphere. Annales Geophysicae. 1998. Part III. Space & Planetary Sciences. Supplement III to Volume 16. P. C839. Chernogor, L. F., K. P. Garmash, A. I. Gritchin, L. S. Kostrov, V. T. Rozumenko, A. M. Tsymbal, and O. F. Tyrnov, Observations of ionospheric D region perturbations which accompanied the Space Shuttle orbiter Atlantis launch with a geomagnetic storm as a background by partial reflection technique. Annales Geophysicae. 1998. Part III. Space & Planetary Sciences. Supplement III to Volume 16. P. C839. Gokov, A. M., S. I. Martynenko, V. T. Rozumenko, A. M. Tsymbal, and O. F. Tyrnov, Variations in the electron collision frequency and electric fields in the lower ionosphere at middle latitudes. Annales Geophysicae. 1998. Part III. Space & Planetary Sciences. Supplement III to Volume 16. P. C841. Gokov, A. M., and O. F. Tyrnov, Ionospheric parameters variations in the lower D region during magnetic storm. Annales Geophysicae. 1998. Part III. Space & Planetary Sciences. Supplement III to Volume 16. P. C831. Gokov, A. M., and O. F. Tyrnov, Midlatitudinal lower ionosphere disturbances caused by natural sources. Annales Geophysicae. 1998. Part III. Space & Planetary Sciences. Supplement III to Volume 16. P. C831. Martynenko, S. I., Coupling between temporal and spatial scales and modeling disturbances caused by external electric field in the lower ionosphere. Annales Geophysicae. 1998. Part III. Space & Planetary Sciences. Supplement III to Volume 16. P. C845. Zakharov, I. G., and O. F. Tyrnov, The relationship between solar wind energy and 27-day non-tidal variations in the length of day. Annales Geophysicae. 1998. Part I. Society Symposia, Solid Earth, Geophysics & Geodesy. Supplement I to Volume 16. P. C58. Zakharov, I. G., and O. F. Tyrnov, Short-term critical frequency variations and their predictions in the midlatitude ionospheric F2 region. Annales Geophysicae. 1998. Part III. Space & Planetary Sciences. Supplement III to Volume 16. P. C899. Zakharov, I. G., and O. F. Tyrnov, Peculiarities of 27-day variations of a length of day due to solar activity, Annales Geophysicae, 1997, Vol. 15, Supplement I, Part I, p. C78. Chernogor, L. F., Experimental investigations of variations in geomagnetic micropulsations near Kharkiv during modifications by the “Sura” high-power installation, Vth International Suzdal URSI Symposium on the Modification of the Ionosphere, ISSMI’98, Book of Abstracts, Suzdal, p. 77, 1998. Chernogor, L. F., K. P. Garmash, and V. T. Rozumenko, Investigations of energetic particle precipitations due to HF radio heating and rocket launch, Vth International Suzdal URSI Symposium on the Modification of the Ionosphere, ISSMI’98, Book of Abstracts, Suzdal, p. 35, 1998. Chernogor, L. F., K. P. Garmash, and V. T. Rozumenko, Effects in the ionosphere during rocket launch, Vth International Suzdal URSI Symposium on the Modification of the Ionosphere, ISSMI’98, Book of Abstracts, Suzdal, p. 84, 1998. Gritchin, A. I., V. L. Dorohov, S. I. Martynenko, V. T. Rozumenko, O. F. Tyrnov, and A. A. Ulyanchenko, Influence of high-power radio waves from high-latitude ionospheric modification on the midlatitude ionosphere, Vth International Suzdal URSI Symposium on the Modification of the Ionosphere, ISSMI’98, Book of Abstracts, Suzdal, p. 40, 1998. Martynenko, S. I., V. T. Rozumenko, A. M. Tsymbal, and O. F. Tyrnov, Partial reflection measurements of the lower ionosphere modification due to atmospheric electrostatic field, Vth International Suzdal URSI Symposium on the Modification of the Ionosphere, ISSMI’98, Book of Abstracts, Suzdal, p. 105, 1998. Last modified: December 14, 2011.